In the last few weeks I have re-discovered risotto and this discovery has led to a passionate love-affair. I do honestly love risotto. It is a quick and simple dinner but it is so tasty and so impressive, I have even managed to impress myself which is not easily done at all! This version of this seductive dish was a mushroom and blue cheese risotto. The mushrooms I used were chestnut mushroomas and I added some porcinis too (the dried type soaked in warm water to re-hydrate) for a little depth of flavour and class. I did not like mushrooms when I was a kid and was wondering about that the other day while creating this mushroom masterpiece. I’m not sure what about them I didn’t like. I think it may have been the somewhat slimy texture they always seemed to have, and also the earthiness of the flavour. The flavour is something that I have grown into but I’m still not a fan of slimy mushrooms. I prefer them to be cooked until browned and not cooked until snail-like and slimy. The bit on mushrooms in Julie and Julia made me laugh – ‘Don’t crowd the mushrooms or they won’t brown’ – and how true it is, I just wish i has a bigger pan to cook them in so they didn’t get crowded all the time! 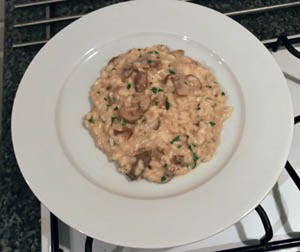 Some non-slimy, browned mushrooms in a white wine risotto with a little Dolce Latte blue cheese – yum! This weeks food strategy is uber-healthy. I have been cooking rather indulgent and butter-and-alcohol-laden dinners lately and although I love them immensely myself and Jel are both in dire need of some light and healthy fare. (I am not counting the chocolate cake I plan to make on Wednesday night for a colleague’s last day in the office) Light is the order of the week and I do plan to stick to it as the trousers are certainly feeling a little tight around the waistline at the moment – even more motivation to head off to the gym tonight.